Yesterday after work I went to Weta to do more painting. There was only The Armchair General’s son there and soon after I was left alone for the evening. Apologies for the poor photographs but I left my camera at home and could only use my rather old and crappy phone camera that has a resolution of about 3 pixels – and I don’t mean 3mp. The workshop we have been working in was freezing – an blast of cold has come up from Antarctica and I swear Mirimar is the coldest hole in New Zealand. 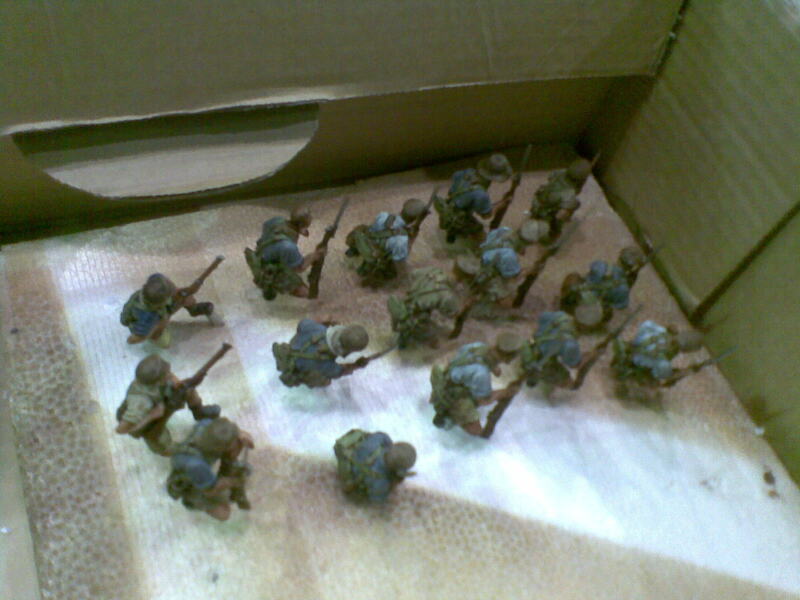 I drilled and pinned over a hundred more casualties – Turk, Kiwis and Gloucestershires. I only managed to do two drill throughs – well I was getting tired. The drilling is one thing – cutting all those brass pins is another. I also painted about fifteen crouching Kiwis waiting to go into the attack. These were done from scratch rather than fix-up jobs. Also six wounded – four for the Maori contingent and two others. 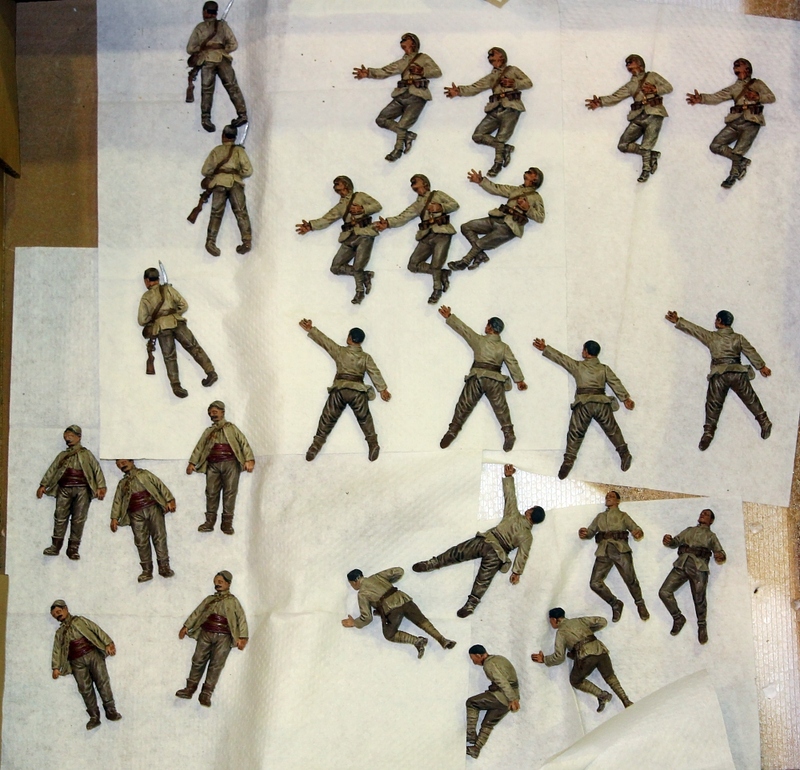 Finally – and there is no photo – I repainted and freshened up fifteen Turkish officers and another thirty charging Turk infantry. 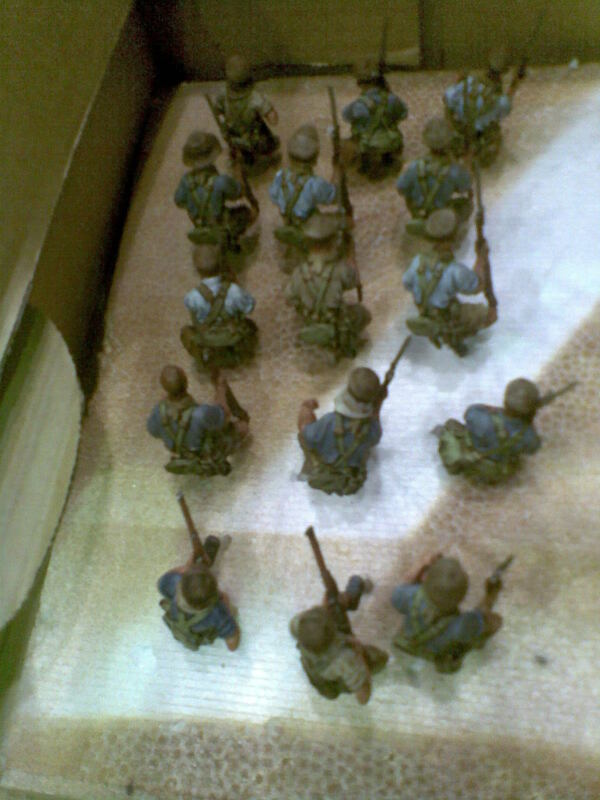 This was mostly dry brushing to tone down some colours and I had to totally paint the rifles and equipment on these guys. All in all I think I had a pretty good evening at the painting bench, even if I was freezing my raho off. For more information on this project visit the official blog site. 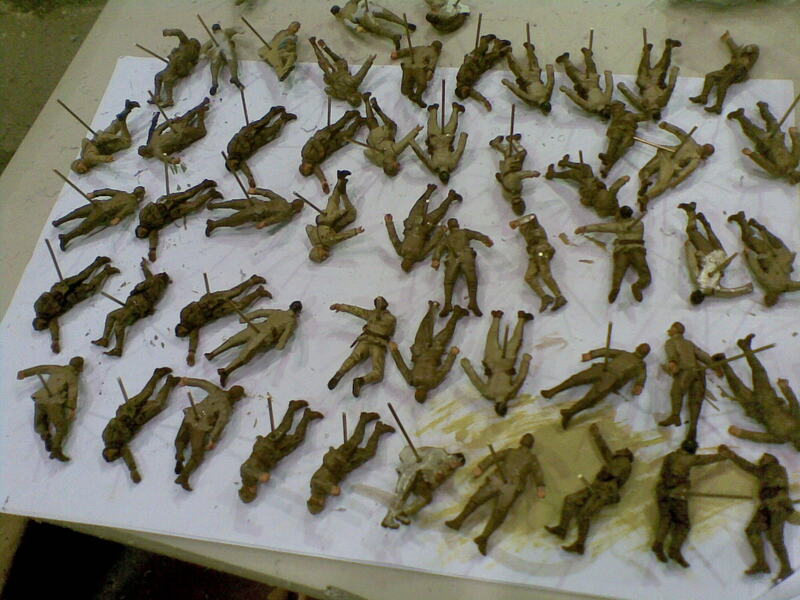 I knocked off these 25 casualty figures last Saturday night when everyone else was at the pub and I had to work. Alan Perry did manage to buy me a beer though. I seemed to become the Dremmel King and must have drilled holes in about a thousand casualty figures in the past week for the mounting pins to be inserted. Had several figures with air bubbles inside – one of which sort of exploded and took off across the workshop at 20,000 rpm when I let go of it in fright. 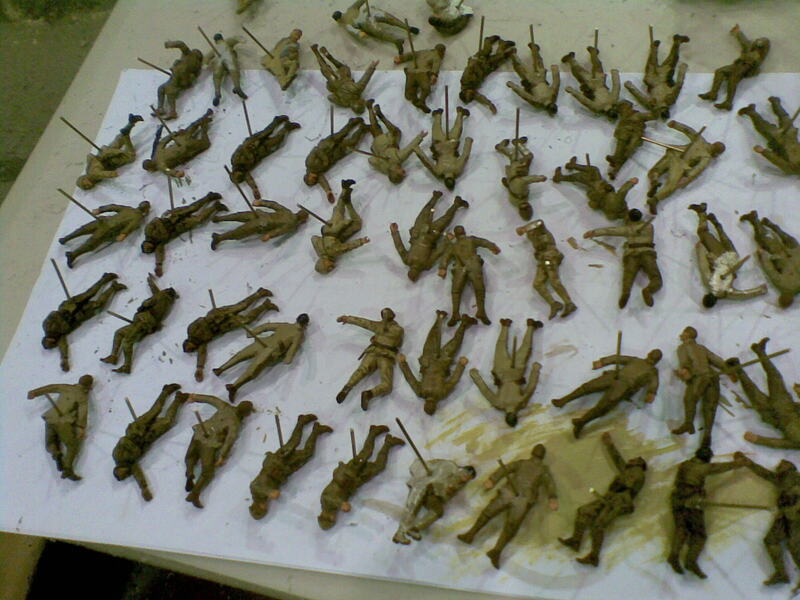 There are a lot of Turkish casualty figures in this diorama. A big bunch of painters were beavering away at Weta over the weekend. The painting side is definitely nearing the end-game. 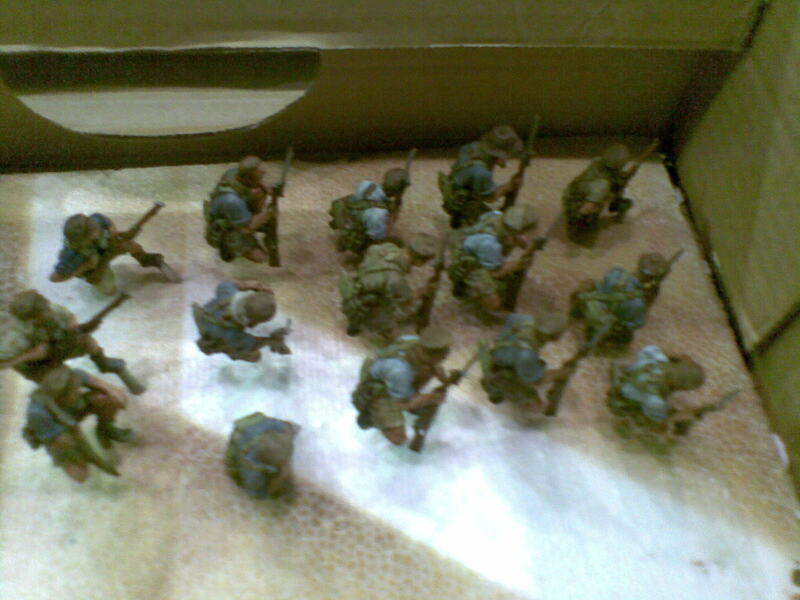 I have another twenty or so Anzacs to paint and hopefully will have them finished today.